From Capital Beltway in Virginia (I-495), take Exit 50B, Route 50 East (formerly Exit 8.) Turn right at first traffic light onto Jaguar Lane. When road curves to the left, CONTINUE STRAIGHT to stop sign. Turn right onto Marc Drive. Marc Drive leads directly into Providence Recreation Center. OPEN TO ALL USA SWIMMING REGISTERED ATHLETES FROM THE INVITED TEAMS. 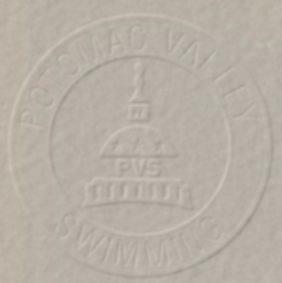 YORK, Potomac Marlins, MAKO, ASA, TIBU, FAUQUIER AREA SWIM TEAM, SWIMMERS SHALL COMPETE AT THE AGE ATTAINED ON THE FIRST DAY OF THE MEET..
PVS and host clubs along with their Meet Directors are committed to the Inclusion Policy as adopted by the BOD. Athletes with a disability are welcomed and are asked to provide advance notice of desired accommodations to the Meet Director. The athlete (or the athlete's coach) is also responsible for notifying the session referee of any disability prior to the competition. CURRENT UNITED STATES SWIMMING RULES SHALL GOVERN THE MEET. THE PRESCRIBED POTOMAC VALLEY SWIMMING WARM-UP PROCEDURES AND SAFETY POLICIES WILL BE FOLLOWED.. PARTICIPATING CLUBS ARE REQUIRED TO PROVIDE TIMERS IN PROPORTION TO THEIR ENTRIES. HOST CLUBS ARE REQUIRED TO PROVIDE ONE TIMER PER LANE. COACHES ARE RESPONSIBLE FOR THE CONDUCT OF THEIR SWIMMERS AND FOR CLEANING UP THEIR TEAM AREA. ANY CLUB THAT ENTERS AN UNREGISTERED ATHLETE, FALSIFIES IN ANY WAY, OR PERMITS AN UNREGISTERED COACH TO REPRESENT THEM, WILL BE FINED THE SUM OF $100.00 AND NO FURTHER ENTRIES WILL BE ACCEPTED FROM THAT CLUB UNTIL THE SAID FINE HAS BEEN PAID. FEES FOR INDIVIDUAL EVENTS ARE $5.00. Â EACH CLUB IS REQUESTED TO REMIT ONE CHECK TO COVER THE ENTRY FEES FOR THE ENTIRE TEAM. PLEASE DO NOT SEND CASH. TELEPHONE ENTRIES WILL NOT BE ACCEPTED. LATE (DECK) ENTRIES ARE $10.00 PER INDIVIDUAL EVENT AND MUST BE SUBMITTED NO LATER THAN 30 MINUTES PRIOR TO THE FIRST EVENT OF EACH SESSION AND WILL ONLY BE ACCEPTED IF THE ENTRY LIMIT HAS NOT BEEN REACHED. EVIDENCE OF CURRENT USA-S REGISTRATION IS REQUIRED FOR DECK ENTRIES. · Entries may be submitted via e-mail. Follow the instructions under the appropriate heading below. The immediately following rules apply regardless of method chosen. · Each club is requested to remit one check to cover the entry fees for the entire team. Please put the club name on the entry check (if not a club check) and note the number of entries. Please do not send cash. Meet directors have been instructed not to accept telephone or fax entries. · Entries not submitted on the required forms, not complete, not legible or not in the required electronic format, will not be accepted and will be returned. The Meet Director will not be held responsible if there is no time to properly resubmit the entry. Optional: Before preparing your entries, events for this meet can be downloaded and then imported into team manager. Download "36mm021708"
· Club E-mail entries will be accepted provided the transmission time is prior to entry deadline. · Clubs submitting by email should submit entries to Nancy Monaghan monaghans@gmail.com In the subject heading type, "2008 Friendship Meet **** with the club's initials substituted in place of the asterisks. · Meet Directors are requested to acknowledge receipt by return e-mail within 24 hours. Clubs submitting entries that do NOT receive an acknowledgement should contact the Meet Director by other than e-mail to confirm receipt.